I have so much “past” that dwelling on it could become a full time occupation. Lots of it is hugely positive – dwelling on having climbed Mt Kilimanjaro (to take just one recent example) is most likely to be a positive experience. Of course a few of those chunks of “past” are not so cheery. The norm is to “move on” and not dwell on those things, unless some demon has to be confronted and exorcised. 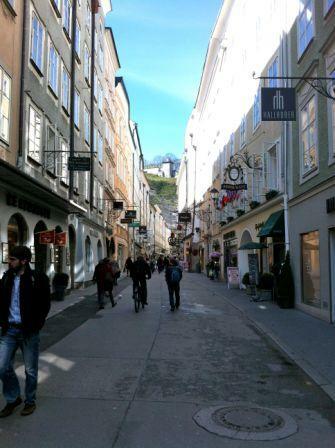 For me, Salzburg was one of those unhappy memories. I was asked to speak at a conference in Waidring (30 minutes drive away) in January 1995 or 96. I planned to attend the rest of the sessions (over 2-3 days) to get credit for my CPD requirements. 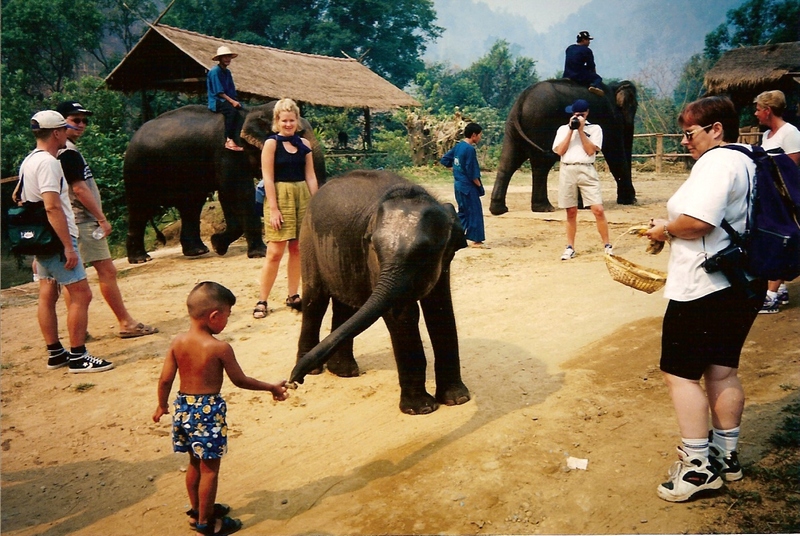 I’d been on holiday in Thailand with wife & 3 year old son over Christmas & New Year and they’d stayed on for an extra week while I did my international conference speaker routine. One day I jumped on the Salzburg bus to do some sightseeing.I reached Salzburg on the bus about lunchtime – ideal for phoning Thailand. A few minutes into the call, I heard a huge commotion in the background. My ex said something was very wrong with Mark and he had to get to a hospital right away. End of phone call. I was left standing in the middle of Salzburg like a zombie, not knowing if my son was alive or dead. In those days mobile phone coverage did not exist in rural Thailand – only in downtown Bangkok. Even landline phone connections could be unreliable. I had no way of keeping in contact and finding out what was going on. It was the next day before I was able to make contact. Turned out he’d had convulsions. The suspicion was that he’d poisoned himself by eating some leaf he’d picked up – you know what 3 year olds are like. He had 2-3 days in hospital, and then he was fine. A couple of weeks ago came the suggestion of a couple of nights away in Salzburg. Sightseeing, nice restaurants and some relaxation. In general, a great idea. But Salzburg… Too many ghosts? Well, off we went. It turned out really well. It’s a lovely wee city. I suspect it might be a bit much in the high tourist season (we were there in mid-April, just after the Easter holidays). The Mozart thing may be a bit over-done, but then it’s a helluva lot better than the Sound of Music thing. Fortunately the latter seems to be of very minor importance except to Anglo American touroids. The castle is magnificent, as are the views from it. The Mirabell Gardens are wonderful too. I actually loved the cathedral, and I’m not a church person at all. Anti-church, to be quite honest. 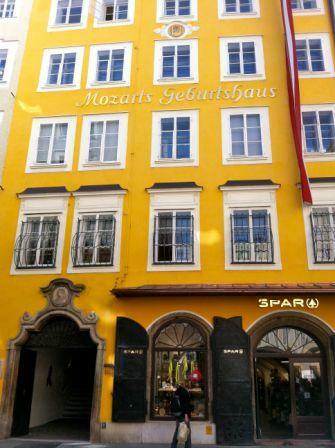 Our hotel was great – one of the few remaining family run hotels, in a 700 year old building in a narrow street in the heart of the old town. Tradition combined with the modern in just the right way. We had 2 dinners and 2 lunches while we were there, and with a little research and a bit of luck we ate and drank extremely well each time. The local beer, wine and schnapps are all fabulous, but watch out for the dumplings. 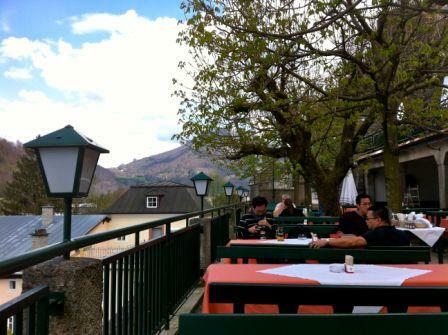 We even had a lunch in a Biergarten– not bad for April! It’s a small compact city, ideally suited to just wandering about. Perfect for a short break. Then you have the Alps as a backdrop. So I think a demon was confronted and a painful memory exorcised. We may even go back! The climbing/trekking season is coming up, and then the ice hockey season comes along after that. I’ve never been to a game in Austria. It might be a wonderful winter destination after all. This entry was posted in Salzburg. Bookmark the permalink.